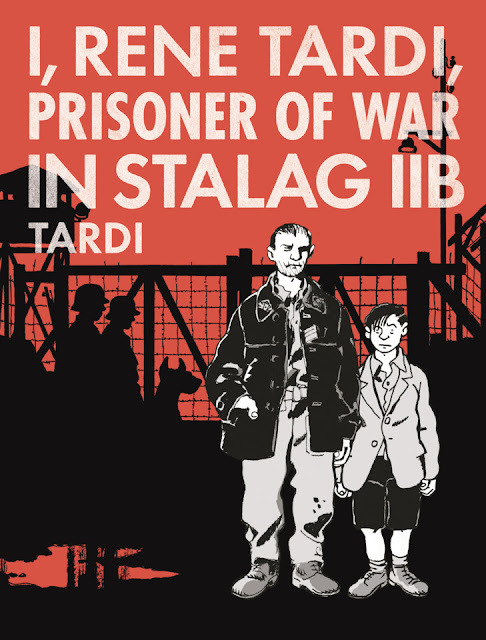 Jacques Tardi encouraged his father, René Tardi, to write down his memories of being a POW in a Nazi prison camp during World War II in the early 80s. Some 30 years later, Jacques drew it as a two part graphic novel. I, Rene Tardi, Prisoner Of War In Stalag IIB part 1 has just been published in English. Not surprisingly, given the ongoing excellence of Jacques Tardi, it's superb. Tardi draws it as a dialogue between himself and his father--drawing himself as a boy in shorts and his father as a young man. But aside from the narrative structure (a father telling his son about what happened to him during the war), it is drawn as a narrative of the war and the camp, Stalag IIB. So while René Tardi engages in a tank battle or starves in a barracks in Pomerania, Jacques, depicted as a boy, is always standing nearby, as if he were there. This surreal touch made me think of David B, a much younger cartoonist but one who has had a fairly profound effect on French Comics. The first volume takes us approximately to the end of the war. The next volume covers Rene's trip home and postwar life. (Interestingly, this mirrors the structure of Primo Levi's classic If This Is a Man and The Truce, the first covering his time before and during his internment at Auschwitz, and the second covering his liberation and circuitous trip home). Undoubtedly people will compare this book to Holocaust narratives like Levi's. Especially to Maus by Art Spiegelman, which is likewise a story told by a father to his son and then turned into comics. Tardi must have had Maus in mind as he worked on this book. In the introduction, it is pointed out that French POWs did not exactly receive a warm welcome when they returned home from their long internment. They were a reminder of the failure of the French to successfully fight the Nazi invaders. They could not be lionized, like Resistance fighters, nor condemned like Vichy collaborators, nor pitied like the small number of Jewish survivors who made it back. But the Stalags were obviously no picnic, as René Tardi's account shows. While the American prisoners had it OK, that was not the case for the French or other prisoners from conquered countries. America had plenty of German POWs, and it was in Germany's interests to treat the Americans well because of it. In fact, different nationalities got different levels of treatment. Those that got it worst were the Russians, who died in appalling numbers in German captivity, as was described in harrowing detail in Timothy Snyder's book, Bloodlands: Europe Between Hitler and Stalin . The French traded laborers for POWs, which was how one of Rene's friends got out of the Stalag early. But Rene endured all the way to the end of the war. The Stalags were not a great crime against humanity like the Nazi extermination camps were (unless you were a Russian POW), but their story deserves to be told. We Americans get a bizarre notion of them from seeing such entertainments as The Great Escape. This book is at a corrective for that impression of the Stalags. René Tardi is an acerbic, cynical person and an unforgettable character. His voice is half the story here (and think a lot of his words are direct transcriptions from the narrative he wrote for his son Jacques Tardi in the early 80s). Without having read the original (I can't read French anyway), I do want to praise the translator Jenna Allen. Previous volumes of Tardi's work from this publisher were translated by the late Kim Thompson, co-publisher and a man fluent in several languages, including French. But of all the Tardi books I've read from Fantagraphics, this is my favorite in terms of the language, and that has to be attributable in large part to Allen's translation.